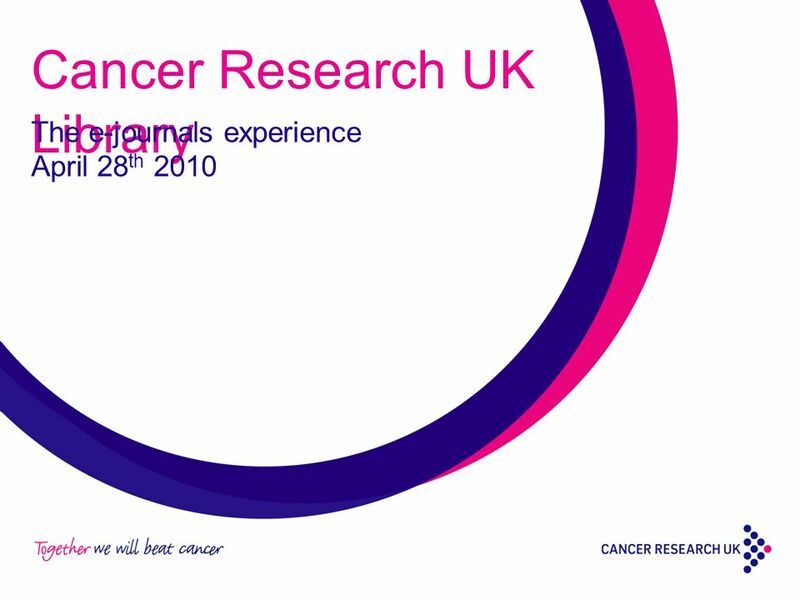 Cancer Research UK Library The e-journals experience April 28 th 2010. 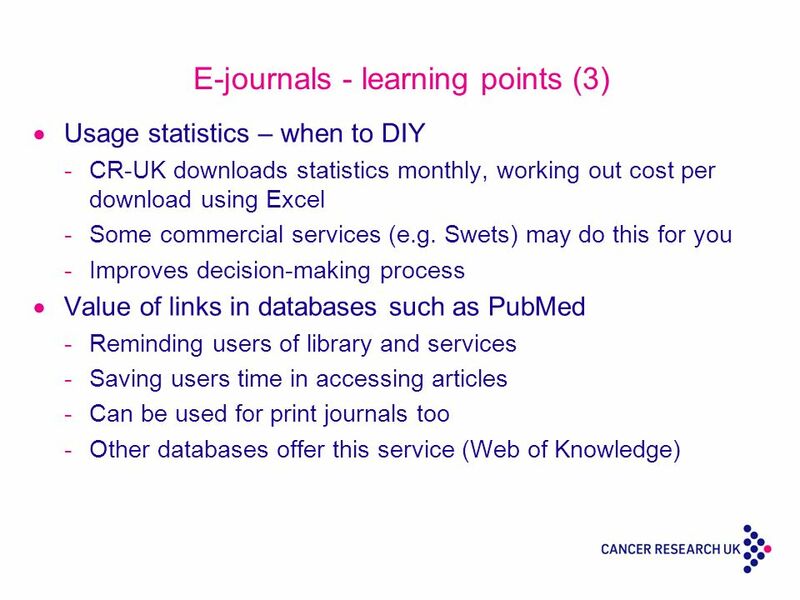 6 E-journals - learning points (1) Does not require storage or growing space -but older print issues need to be kept -so will the library shrink in size ? -especially when used in conjunction with UKPMC Is of particular value to those libraries where users are spread across a wide geographical area -Membership organisations, multi-site workplaces -What about access to archival print issues ? 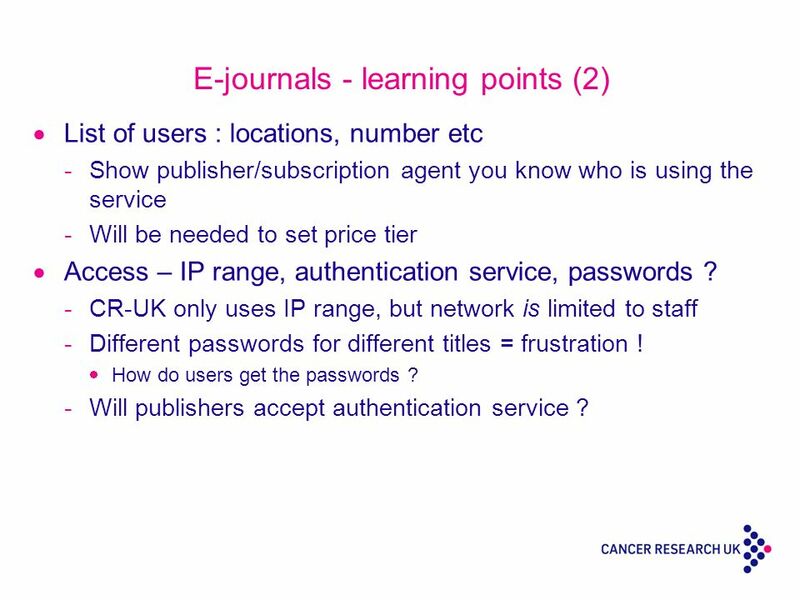 7 E-journals - learning points (2) List of users : locations, number etc -Show publisher/subscription agent you know who is using the service -Will be needed to set price tier Access – IP range, authentication service, passwords ? 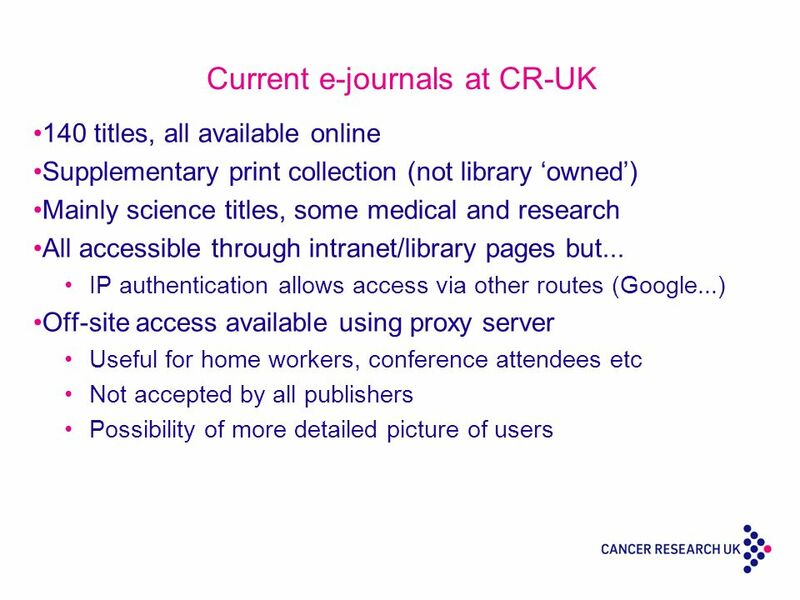 -CR-UK only uses IP range, but network is limited to staff -Different passwords for different titles = frustration ! How do users get the passwords ? -Will publishers accept authentication service ? 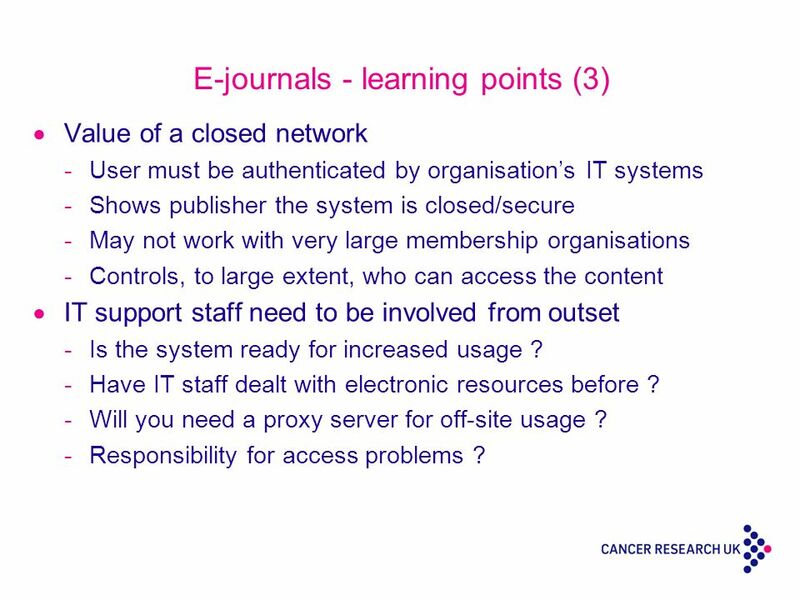 8 E-journals - learning points (3) Value of a closed network -User must be authenticated by organisations IT systems -Shows publisher the system is closed/secure -May not work with very large membership organisations -Controls, to large extent, who can access the content IT support staff need to be involved from outset -Is the system ready for increased usage ? -Have IT staff dealt with electronic resources before ? -Will you need a proxy server for off-site usage ? -Responsibility for access problems ? 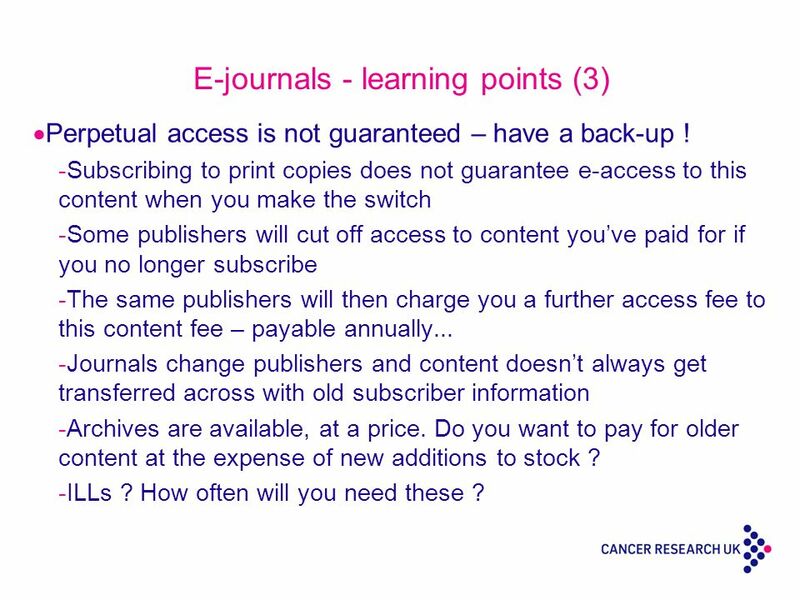 10 E-journals - learning points (3) Perpetual access is not guaranteed – have a back-up ! 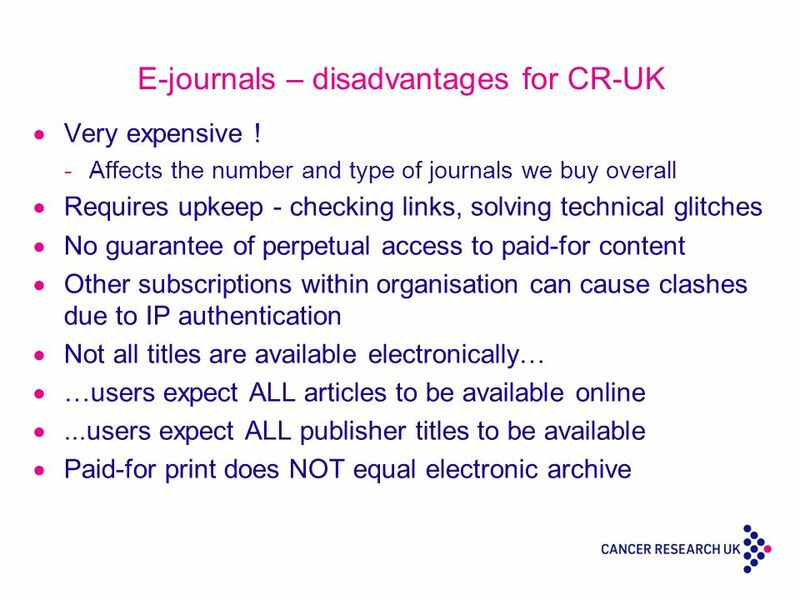 -Subscribing to print copies does not guarantee e-access to this content when you make the switch -Some publishers will cut off access to content youve paid for if you no longer subscribe -The same publishers will then charge you a further access fee to this content fee – payable annually... -Journals change publishers and content doesnt always get transferred across with old subscriber information -Archives are available, at a price. Do you want to pay for older content at the expense of new additions to stock ? -ILLs ? How often will you need these ? 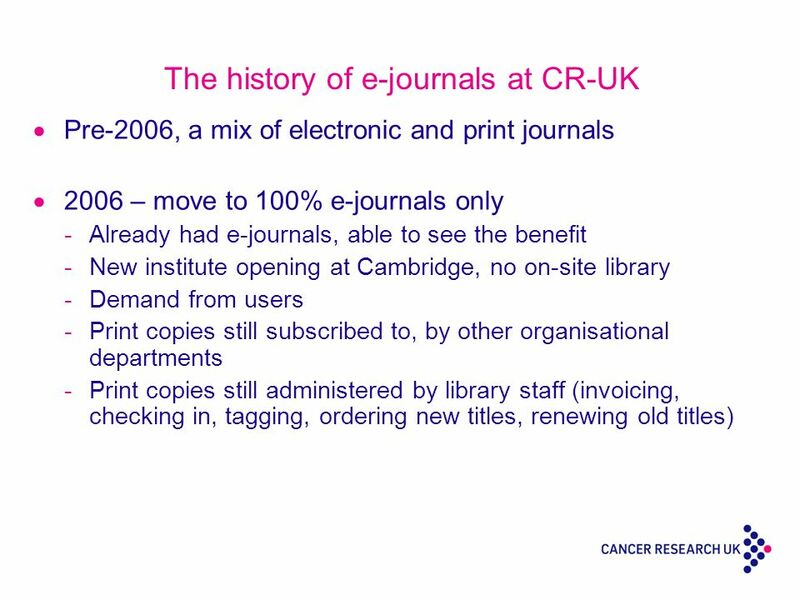 Download ppt "Cancer Research UK Library The e-journals experience April 28 th 2010." Introducing…. Brand new content platform from John Wiley & Sons (replacing Wiley InterScience) New user interface delivers intuitive navigation for all. E-resources Collection Management Anna Grigson E-resources Manager. De Gruyter offers competitive pricing and customer-friendly business models for all its content: eProducts for Everyone De Gruyter e-dition Print + eBook. Licensing in the Real World: the Ins & Outs of Licensing Agreements Edith Starbuck & Jane Thompson AIT&L Health Sciences Library. Supply Models What are publishers offering and how can libraries access electronic journals and scholarly databases? HINARI – Accessing Articles: Problems and Solutions. University Library W(h)ither the big deal Is e-journal purchase about to fragment? Martin Gill Faculty Team Leader Arts and Social Sciences Faculty Team. Carrie Sherlock The College of Optometrists. 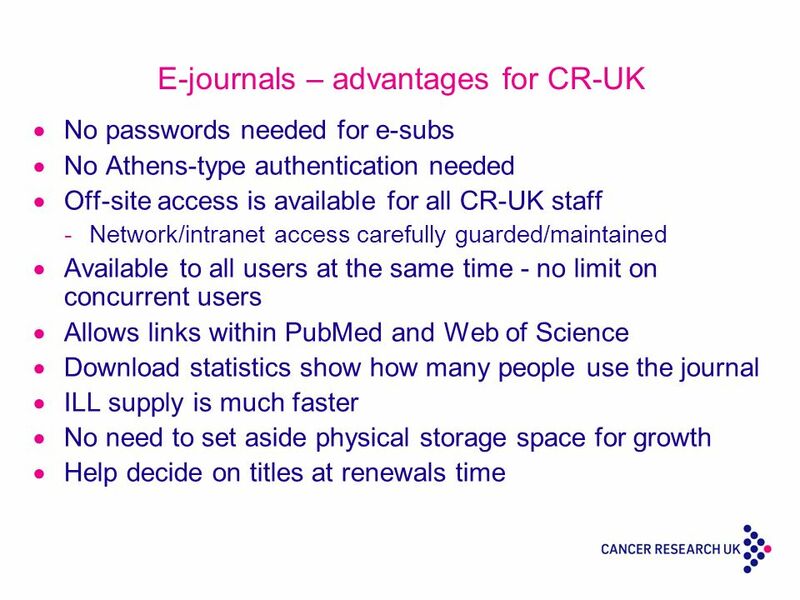  Greater availability of E-Journals  Users now expect access from anywhere, anytime  Many of us are running. Open Access: what you need to know This work is licensed under a Creative Commons Attribution 4.0 International License.This work is licensed under a Creative.